Articles – Under Every Leaf. Many Indian Regiments adopted the Bagpipes after coming into contact with Highland Regiments. The regiments from the North West Frontier of India especially had an close relationship with the Highlanders and eagerly adopted the Pipes and some regiments even had their own ‘Clan’ Tartan. The Graphic 6th November 1915. Empire Day (24th May) Parade Shanghai 1920’s. This great video (no Sound) shows British Officials and Military officers enjoying Empire Day (24th May). The Video shows British Sailors, British Army units, including a Scottish Highland regiment and Indian Army Regiments parading and then marching past. A fascinating glimpse into the Empire at its highest extent. “From Hong Kong, the Gibraltar of the East , a force has been moved towards Tientsin consisting of 300 Welsh Fusiliers and 900 Indian troops. The Hong Kong Regiment is under the command of Lieutenant-Colonel Retallick of the 45th Sikhs. He is forty-three years of age and saw service in the Afghan War of 1880, for his conduct in which he was decorated and mentioned in Dispatches. First Colours of the Hong Kong Regiment presented in 1895 by Sir William Robinson. Types of the Hong Kong Regiment (Natives Ranks in Red). The Life of Colour Sergeant Knight. This is an extended article from what I posted on Facebook earlier this week. In July 1856 at the end of the Crimean War the returning troop gathered at the Military camp at Aldershot for a Victory parade through the streets of London. Early photography pioneers Robert Howlett and Joseph Cundall were also at the camp and in a series called “Crimean Heroes 1856” captured in this new medium some of these conquering heroes. The picture below is of Colour-Sergeants J Stanton, Kester Knight and W Bruce, of the Royal Sappers and Miners freshly returned from Turkey, all three were grizzled veterans and had served in the Crimea for the duration of the War. Kester Knight was born 1827 in Haslemere Surrey and was apprenticed as a carpenter. On the 12th May 1846 aged 19 he joined The Royal Sappers and Miners at Woolwich and listed carpenter as his profession. Knight proved to be a model solider and steadily moved up the ranks, While posted in Gibraltar he was promoted to 2nd Corporal on the 9th July 1851 and then full Corporal on the 23rd February 1854. During the spring and summer of 1854 the clouds of war were gathering across Europe as the empires of Britain, France and Russia fought over the dying carcass of the Ottoman Empire. With public opinion across Britain demanding war the British Government dispatched its biggest Army overseas since the Napoleonic Wars. The Crimean War (October 1853 – February 1856), also known in Russian historiography as the Eastern War of 1853–1856 (Russian: Восточная война, Vostochnaya Voina), was a conflict in which Russia lost to an alliance of France, the United Kingdom, the Ottoman Empire, and Sardinia. The immediate cause involved the rights of Christian minorities in the Holy Land, which was controlled by the Ottoman Empire. The French promoted the rights of Catholics, while Russia promoted those of the Orthodox Christians. The longer-term causes involved the decline of the Ottoman Empire and the unwillingness of the United Kingdom and France to allow Russia to gain territory and power at Ottoman expense. It has widely been noted that the causes, in one case involving an argument over a key, have never revealed a “greater confusion of purpose”, yet led to a war noted for its “notoriously incompetent international butchery. 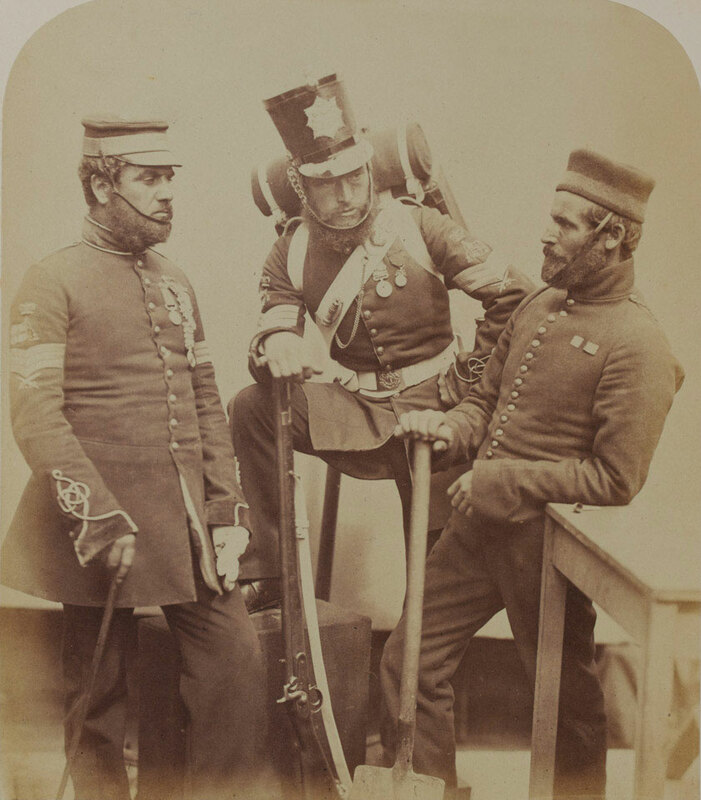 Part of this force included Engineers and men of the Miners and Sappers who had been stationed at Gibraltar since 1849, Corporal Knight landed on the Crimean peninsular with the rest of his regiment on 14th September 1854. They immediately set about getting the stores ashore and setting up a camp for the army. The British and French Armies marched in land and fought the first major battle of the campaign on the banks of the Alma and repulsed the Russian defenders but failing to follow up the beaten and retreating Russians gave them the chance to retreat to the safety of Sebastopol and its large Star Fort. Believing that the Northern approaches to the city were too well defended the British and French Commanders agreed to attack the city from the south. As the army settled down for the siege of the city the men of the Royal Engineers and Miners and Sappers came into their own. Trenches, gun emplacements and the army encampment were all built and by the 26th of October the British had 73 guns ready for the bombardment of the city walls. Corporal Knight would’ve lead work parties of infantrymen who would dig trenches and build gun embrasures under the direction of a Royal engineer officer (one who would later be Lord Wolseley). He would also have fought of Russian raiding parties who would sortie out from the city to try and destroy trenches, guns or capture the tools carried by the men. As a further consequence, the front was not protected by sentries, so that a sortie or surprise of some sort was just might have been anticipated. As we have seen there was a sortie and the surprise was complete, but Wolseley was equal to the occasion. The working-party, finding themselves surrounded, cast down their tools or arms and bolted to a man. In vain the officers did all the could to stop the stampede. Wolseley seized by the belt one man who was in the act of flying, but was instantly knocked down by another fellow who took this irregular method of releasing his comrade, Wolseley found there was nothing between himself and the Russians but the gabions which they were pulling down with celerity. Looking about him with the intent of rallying his men, he found that he was alone; all had fled, the officers, recognising the futility of resistance without their men, being the last to retire. 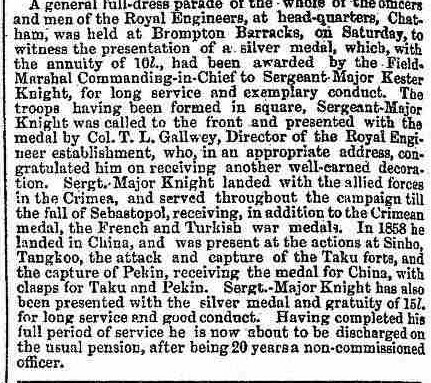 On the 1st of April 1855 Knight was promoted to Sergeant and 4 months before peace was declared he was promoted to Colour-Sergeant. “Joined the Army at Scutari in May, 1854. Present at every bombardment. Specially selected by Colonel Tylden for important daily duties in the trenches of the right attack, and was subsequently strongly recommended by him for promotion which he received”. He sailed for home on the 19th January 1856. He was home for less than a year before sailing for China in time for the start of the Second Opium War. The Second Opium War, the Second Anglo-Chinese War, the Second China War, the Arrow War, or the Franco-British expedition to China, was a war pitting the British Empire and the Second French Empire against the Qing dynasty (present day China), lasting from 1856 to 1860. Little is known of Knight’s service in China but he served a total of three years in china and was awarded The China Medal 1857-1860 with clasps for Taku Forts 1860 and Pekin 1860. After returning to Britain in the Autumn of 1861 he was posted to the Royal Engineers depot at Chatham and on the 6th May 1862 received his final promotion to Sergeant Major. Conduct has been very good and he was in the possession of one good conduct badge when promoted and would had he not been promoted have now been in possession of five good conduct badges. After serving for 22 years 295 days and being awarded the Meritorious Service Medal in 1869 Sergeant-Major Kester Knight retired. 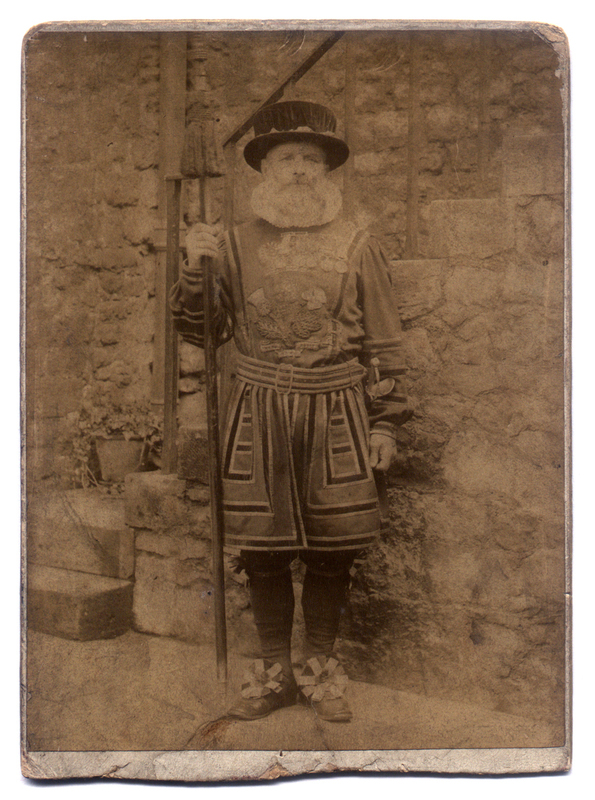 In 14th July, 1878 Knight he was rewarded for his service with a post of Yeoman of the Guard at the Tower of London. 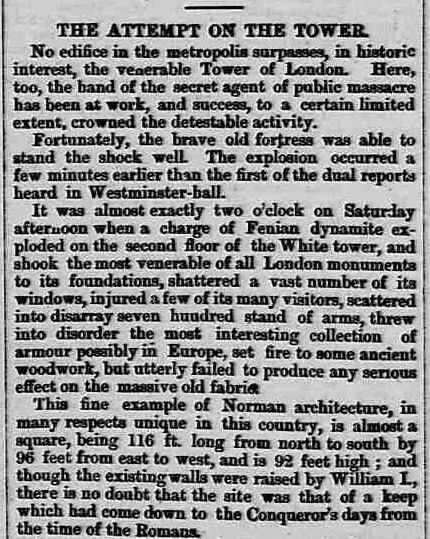 He lived at the tower with his wife and was one of 39 Yeomans on duty when a Fenian terrorist attacked the Tower with dynamite. Yeoman Warder Kester C. Knight Water Lane not far from the Traitor’s Gate in the Tower of London. Knight was a Yeoman for 16 years before dying on the 11th June, 1894 at the Tower. So ended the life of this remarkable Victorian solider.